Predict the scores for 25 Championship games. Three points awarded for predicting the correct scores, one point for predicting the correct result. Predict the correct score in a Jags win to collect a bonus point. The competition will begin with the fixture due to be played on Friday 1 March and will conclude with the games scheduled on Saturday 30 March. I will send out a list of the fixtures weekly, by PM, with a date and time that entries need to be submitted by. If anybody is going to be out of contact during any of this period, let me know. Predictions can be submitted for all the games at any time, so no need to miss out. After the deadline each week, all the predictions will be published on the forum thread. If I don't have your entry by then, no points will be accrued that week. 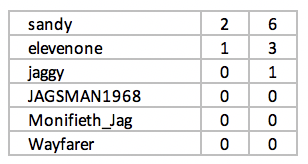 After the final game each week the updated league table will be published on the forum. When predicting the scores for the last round of matches I will ask also for a first goal time for a match that I will select. In the event of two or more players being level at the end of the competition the following steps will be used to break the tie. 1. The most correct scores. 2. The earliest correct score in the competition. 3. Total number of goals predicted is closest to the number of goals actually scored. 4. First goal time is closest to the actual first goal time, as published at spfl.co.uk. If the match score is 0 - 0, the closest time to 90 wins. Players in the Callum Wilson League should note that Peaty FC has decided to only make one entry although he is entitled to two. Your chances of winning have gone up again! Just three players will contest this competition. Great chance to win for those remaining. Two Round One games rearranged. Therefore only two games played. And my internet access at home is down. Oh well, not many takers this week. The Ayr United v Partick Thistle match has been scheduled for 23 April. Unless the clubs agree to bring it forward, it will not feature in these competitions. Late arrival. I guess we'll all get used to these Friday kick offs eventually. Sorry, nothing has arrived at Sponsorship HQ. I presume your picks were sent by PM? I will check with Admin to see if there is a place where wayward messages end up. Hopefully I can verify your predictions and dish out some points. The Ayr United v Thistle tie is unlikely to feature in the competition. At the moment it is scheduled for 23 April, after the competition has ended. The team here at HQ have been working on this all night. Having read their report I conclude that Monifieth_Jag's predictions were sent on Thursday, as claimed. I have updated the table. This has not, to my knowledge, happened before. With this era of Player Sponsorship coming to an end, I not about to introduce any way of double checking. By convention, I always acknowledge receipt of predictions. In fairness to Monifieth_Jag, as a new player he won't particularly have noticed this. If you don't get a reply or your prediction are not listed at the deadline, get in touch. Please note: Ross County v Falkirk on Tuesday is not part of the competition. sandy, you are unable to receive PMs. Perhaps your inbox is full? Could be all of sandys fan mail clogging his inbox. Inverness v County postponed. Good news for those that haven't got their predictions in on time! Only 8 of the scheduled 15 games have been played. More postponements next week too.